Any Season, It’s all Here Waiting for You! 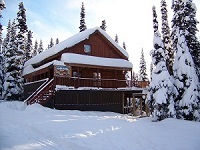 Situated on the slopes of Hudson Bay Mountain at Smithers’ ski hill, year-round recreation awaits you. 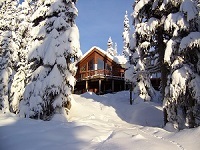 Step out your door to enjoy downhill skiing, snowshoeing and cross-country skiing in the winter. In the summer, fill your stay with hiking, mountain biking or world class fishing. Enjoy wildlife viewing and stunning scenery year-round. Enjoy: – Beautiful mountain views, 25 minutes to downtown, Fully equipped kitchen with appliances, Sleeps 8-10 comfortably (linens provided), Large woodstove (wood provided), Full entertainment system with DVD, surround sound, and 36” LCD TV, Outdoor BBQ on sun deck, Three piece bathroom, Ski in/ski out, Located near parking lot for easy access. Looking for something different this year? Park your RV or Camper on the mountain just steps away from all the action! $600 for the season (plus tax), or $50 weekly (plus tax). For short term stays, park in P2 for $15 nightly, or $25 with 120v service (plus tax). Register at Guest Services during regular hours, and be sure to display your permit. Vehicles over 22’ must reserve in advance, as they may not fit in some of our RV spots. If you check yourself in, be prepared to have to adjust your position if our operations team asks. Overnight and multi day parking is permitted from Wednesday through Sundays only, and only in designated parts of P2, except during Christmas and March breaks. Call us for details during these special times of the year. Please see signage in P2 for specific instructions on where to park, or ask our team for help. Spots are limited so contact us today to book. Deposit required for long term stays.